One of the things customers have always loved about Silk Route is their wide range of fits and lengths. Silk Route has gone beyond the fashion industry norms to give their customers up to 4 different fits in 5 different lengths, catering for a wide range of body frames and heights. Our apparels are offered in up to 4 fittings; Slim, Regular, Loose and Extra Loose. Thereafter, we provide up to 5 lengths for heights 5'0" - 5'8" (152-172 cm). Have a look below to see how Silk Route fittings corresponds to international sizing and matches up with the sizing standards of your country/region. Silk Route Jilbabs and Abayas are available in all four fits. Slim and Regular come in 5 lengths for heights 5'0" - 5'8" (152-172 cm). 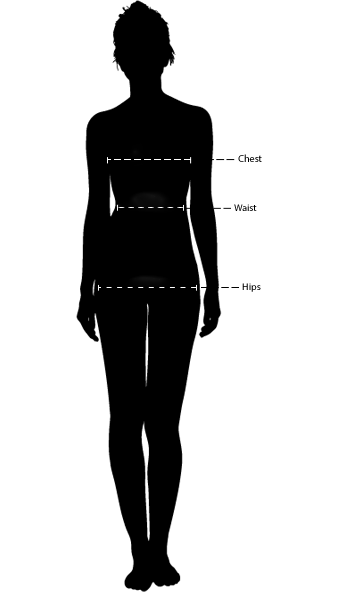 Loose and Extra Loose are available in the most common heights (see chart below). So, if you are 5'4" tall and a UK size 12, your ideal Jilbab or Abaya size would be Regular 56. Person Height (inches) 5'0" 5'2" 5'4" 5'6" 5'8"
Silk Route tops come in 4 fittings and various lengths (thigh, knee and 3/4 lengths) to suite your height, whilst maintaining your preference of modesty and giving you more styling options. So, if you are a UK size 12 your ideal top fitting would be Regular. Silk Route skirts are available in 3 lengths; Petite, Regular and Tall for heights 5'0" - 5'8" (152-172 cm). Each length is also available in Slim, Regular and Loose. So, if you are UK size 12 and 5'4" tall your skirt fit would be Regularand Regular length. Person Height (inches) 5'0" 5'4" 5'8"
Silk Route trousers are available in 3 lengths; Petite, Regular and Tall for heights 5'0" - 5'8" (152-172 cm). Each length is also available in Slim, Regular and Loose. So, if you are UK size 12 and 5'4" tall your trouser fit would be Regular and Regular length. Silk Route Hijabs come in one length and 3 different widths because we know customers love having options on how they style their hijabs. The maxi hijab are great for coverage without compromising on style. C: Your seat measurement should be measured around the fullest part of your seat.